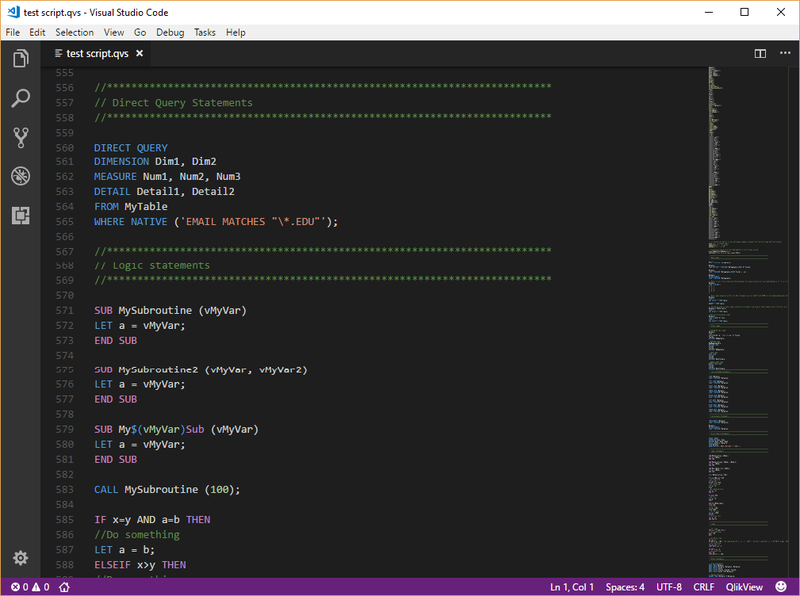 I'm a big fan of Microsoft's free code editor Visual Studio Code (VSCode). For some time now I've been using it for various non-Qlik projects including Arduino based ones. 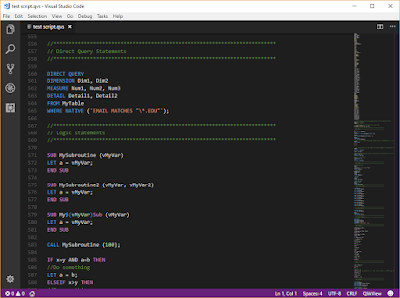 Recently I decided to make the leap to working with Qlik script files in VSCode rather than Notepad++ (NPP) which had been my go-to editor for many years. Although Notepad++ is a perfectly capable text and code editor, there has been a large increase in competition in recent years and NPP has gotten left a little behind. One very relevant example is NPP's syntax highlighting engine which only supports very basic highlighting whilst the majority of the competition have moved to RegEx based engines that can provide much more accurate highlighting. Having been using VSCode for several months now, I thought I'd share some of the extensions and tools I have begun to find very valuable when working with Qlik script files. If you'd like to help translate the plugin into other languages, please get in touch. If you have the plugin installed already, the update should become available in the WordPress admin control panel of your site. Full details of how to install and use can be found here. Qlik for WordPress v2.0 has just been released. This release provides the biggest improvements to date, bringing a large number of new features as well as the usual tweaks and bug fixes. If you've tried the plugin before and found it stopped other features and plugins from working, give it another try as hopefully this issue has now be resolved. The plugin now has its own settings page where you can turn on or off the otional features. Am I still alive? Yes, thankfully I am. Have I given up Qlik? Are you kidding? Until they develop an effective treatment I'll remain an addict.